Our PHP encoder protects your PHP code by compiling the PHP source code into a binary bytecode format, which is then supplemented with an encryption layer. PHP 7.1 and PHP 7.2 are fully supported. FREE 14 DAYS TRIAL AVAILABLE! Here are some case studies to show how PHP Code protection benefits SourceGuardian customers as a PHP Encoder and PHP Compiler. SourceGuardian provides full PHP 4, PHP 5 and PHP 7 support including the latest PHP 7.2 along with many other protection and encryption features. "We supply our software to enterprise customers who need to protect their brand online. 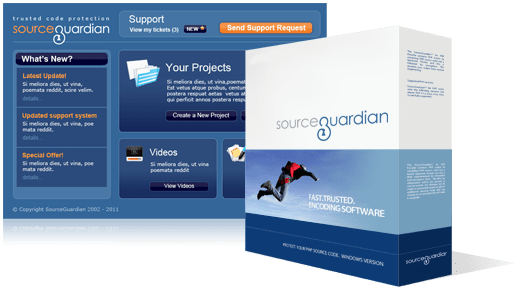 SourceGuardian lets us install on our customers machines without worrying about our intellectual property"
Protect PHP - Become a partner of SourceGuardian. SourceGuardian currently works with partners across the globe who promote and use SourceGuardian. Our partnerships vary, but we are always looking for good quality companies, where there is a synergy between our products and their existing offerings. If you have reach into the PHP market, please contact us to discuss the potential ways that we can work together.